As far as unusual fast food chains go, they don't get more unusual than Lotteria. And thus, we have this, a burger mouse. This is a one-of-a-kind item that's part of a Lotteria Twitter campaign to mark the seventh anniversary of Lotteria's line of "zeppin" (superior) line of burgers. 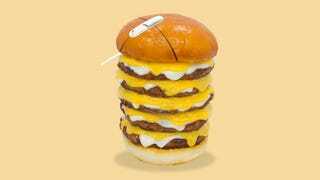 Earlier this fall, Lotteria also had USB memory sticks shaped like its five-patty zeppin cheese burger and five-patty shrimp tree burger. This huge mouse is as big as the actual five-patty cheeseburger. One lucky winner will get to surf the internet with it. Or damn near try to.